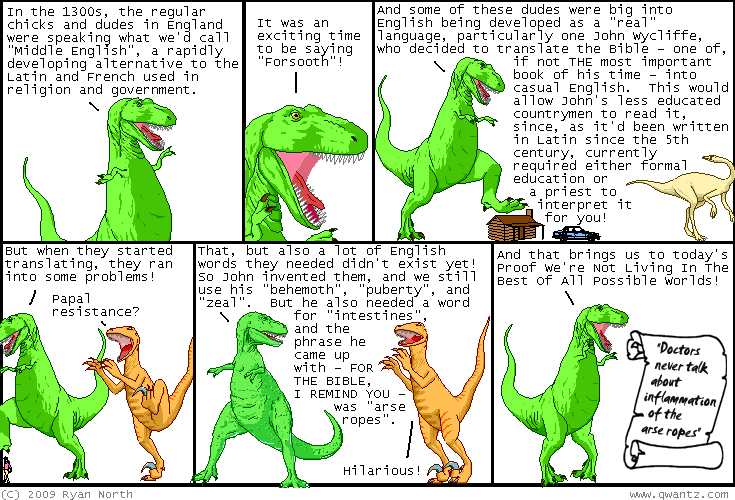 Dinosaur Comics - September 9th, 2009 - awesome fun times! September 9th, 2009: Jenn pointed me to this video involving a rabbit and a bear (the "Japanese Ukulele Duo") playing "Walk, Don't Run". It is adorable and I approve 100%! At the beginning the rabbit says "lets get this over with quick, so we can go eat". Bear says "yeah". Rabbit says "Let's go". Most of the rest of the lyrics are "isogabamaware" which is almost like the proverb haste makes waste. On the grass they're talking about relaxing, and going slow. Rushing is bad. After the song the rabbit says "perfect".